Blog Candy Alert and a Spooooooky MFTeaser! Well, so I never made it back over here yesterday to give you a sneak peek at what's coming from My Favorite Things. I got too busy making more with the new sets because I can't put them down, they are so fun!!!! Before I get off on a tangent, I have important news for you from Storage Units, Ink and More! I had the privilege of speaking to Denise Wenzloff, the super sweet owner of Storage Units, Ink and More on the phone yesterday for the first time and she is absolutely delightful to talk to! We talked as if we were old buds!! (Thanks and waving hi, Denise!) We did a little brainstorming and will have some fun stuff coming up soon that you won't want to miss! More on that in the coming weeks. But for now, I just wanted to go ahead and give you the line-up for some Blog Candy offerings that she is sponsoring through each of the Design Team member's blogs. Here you go!! OK, I hope ya'll are still here and haven't wandered off too quickly after getting so excited over the blog candy alerts! So here's some background on this MFTeaser!! 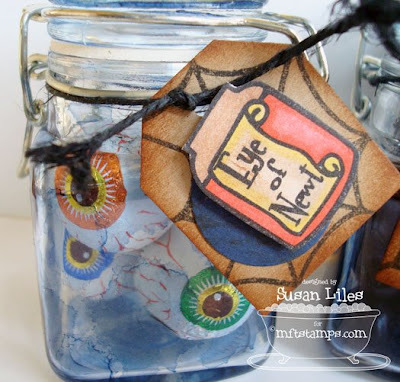 I knew the minute I saw these little jars of "specimens" stamps from My Favorite Things, I wanted to make them into little "specimen" jars myself! I remember a Halloween party I went to once and my friend had made the coolest decorations like these. I've wanted to try it ever since! I picked up the jars at Michael's on clearance the other day for .50. I swabbed Adirondack Alcohol Ink in Denim on them for a spookier look! They are filled with eyeball chocolates, black M&M's and Candy Corn (sure wish I could have found them in green for frog toes, but no such luck!). More Fun News: My Favorite Things is having a New Release Cocktail Party on Wednesday, August 6 from 9-11 p.m. Eastern time. This month there are FIVE new sets being released and some great new ribbon added to the store. Head over to the MFT forum and bookmark it to find out all the details and to find out how YOU can be the next MFT Guest Designer. We hope to see you there this Wednesday night!! TIP: Scruff up the ends of hemp twine with your fingernail for a more worn look. The bluish look to the jars is very clever. Great job on this! LOVE IT!!! Just too cute & so creative. I might have to CASE this for party favors for our annual Halloween Potluck we have. The kids will love it!! How clever! 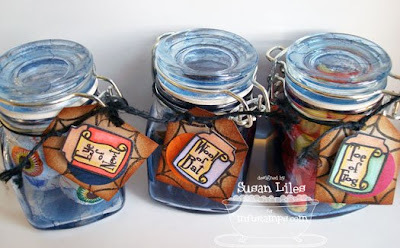 I love these jars...great project! SO darn cute! Those would be a fantastically creepy addition to any Halloween party table!!! Omigosh! These are TOOOOOOOO CUTE! LOL! Your specimen jar is a hoot!! Excellent artwork w/lots of fun! These are sooooo cute! What a great idea for a Halloween treat!